Over the last week I’ve argued that much of the current ‘recovery’ can be explained by a fall in the UK household savings ratio. Something I warned against last year. Real wage falls, changes to taxes and benefits and inflation have all contributed to a tight squeeze on living standards and less money in people’s pockets. But, as the ONS make clear today, household consumption continues to grow. To reconcile these facts, we need to look at the second important bit of information in today’s release – the household savings ratio. The saving ratio in Q1 2013 was 4.2% following 5.9% in Q4 2012. This decrease was due to a rise in household final consumption and a fall in compensation of employees in the latest quarter. In plainer terms – household income fell but household spending rose and the difference was a decline in household savings. The savings ratio is now back down to it’s lowest level in 4 years. 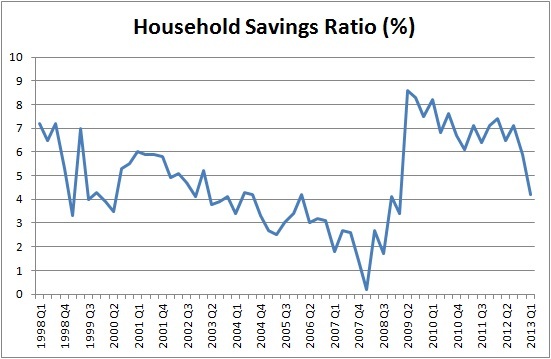 As the chart below makes clear, there has been a substantial fall in the household savings ratio over the past year. On Twitter last night Jeegar Kakkad had an excellent idea – why not illustrate how much the decline in the savings ratio has propped up growth by constructing a hypothetical scenario in which the ratio did not fall? The results are actually quite interesting and really do bring home the extent to which the current recovery is being underpinned by a falling savings ratio. (All data is from the current National Accounts). To start with, this is the actual data on household income, savings and spending from the ONS. As can be seen between Q1 2012 and Q1 2013 household consumption rose by around £10.6bn, but household incomes rose by less than £2.0bn. The difference was a £8.7bn fall in gross household savings. (Note – these numbers are all in current prices). The table below shows what would have happened if the savings ratio had not fallen from 7.4% to 4.2% over the same period. I have left household incomes exactly the same but assumed households continued to save 7.4% of their available resources and consume the rest. As can be seen by comparing the two tables, in Q1 2013 (at current prices) household consumption would have been almost £9.0bn lower without a fall in the savings ratio. To map these out into an impact on GDP, two steps must be taken. First the current price data above should be deflated into 2010 prices (the reference year currently used in table C2 of the National Accounts) using the gross domestic expenditure deflator (found in table A1). Second, and to be fair, it should be remembered that less consumer spending would have meant less imports. To model this I have assumed that 30% of all household consumption would have fed into imports (the basis for this estimate is that imports have consistently been around 30% of domestic expenditure – in reality the import content of capital spending is typically higher, so a fairer estimate for household consumption would be around 25% or so, but I’m being generous/cautious here). My, slightly back-of-the-envelope, calculations suggest that if the savings ratio has remained at 7.4% over the past year, GDP would now be around £5.9bn smaller than it currently is. Between Q1 2012 and Q1 2013 the UK grew by 0.3%. If the savings ratio had been constant it would have contracted by 1.3%. 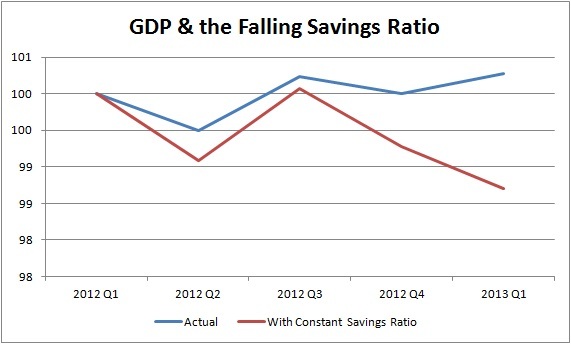 In other words, a falling savings ratio really is underpinning our recovery. The ‘new economic model’ looks increasingly like the old one. The OBR projections based on Osborne’s 2010 spending review predicted a collapse in savings and a massive increase in private debt as the basis for growth and the fall in government borrowings. It looks like this prediction was delayed in coming to fruition but is now doing so. It is not sustainable but might be sustainable enough to keep the economy afloat until after the next election. The table which showed the increase in private debt was well hidden deep in OBR’s report and there was little or no mention of it at the time in the news. Such is the state of financial and economic news reporting in UK media. Unemployed, I have been living on savings for two and a half years. Will resort to benefits when all gone.Waiting for ever receding pension age. Thousands like me. Almost everyone I know with a small business or who are self employed has been propping up their business for the last 2 to 3 years with savings . There is simply no profit to be made . Most of them including myself are now at the point of complete collapse unless they have assets too sell .